Serve up coffee or hot chocolate in these personalized 12 ounce paper to-go cups which feature a built-in cup sleeve to keep your hands comfortable while your beverage stays nice and hot. Personalize the front of your cups with a design and up to three lines of custom text. 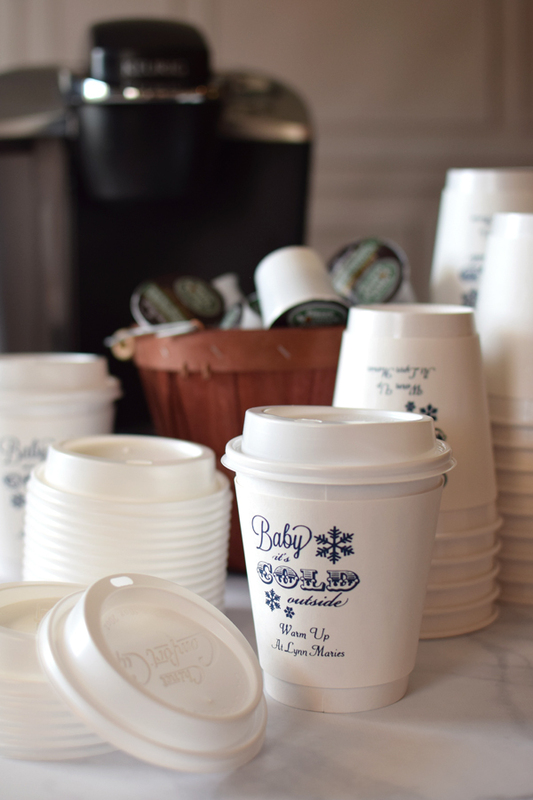 Each insulated, paper cup will hold up to 12 ounces when full to the brim. Matching lids are included for the perfect take home coffee cup. Cups measure 4 inches high x 3 1/4 inches in diameter. Great to set next to a winter wedding hot cocoa station or next to the Keurig or coffee pot. I love the coffee cups. They turned out very cute. It will be a nice touch at the bridal shower. Overall great experience with tippy toad. I had a special font request that they were able to accommodate. The transaction was smooth, the response time was short, everything happened on or ahead of schedule. The product is exactly as pictured and itÃ¢â‚¬â„¢s perfect for our needs! This vendor was able to incorporate what I wanted to say on my cups. Speedy deliverly! I can't wait for my guests to see/use them! I ordered these for a coffee dessert party I had hosted. The cups are of good quality and they were festive. I ordered to close the party date to request the option of a layout review. In hindsight, that was unfortunate bc I would have definitely made changes. The font I chose was pretty but hard to read so none even noticed our personalized touch unless I pointed it out. That was disappointing bc that was my reason for buying in the first place. Also we picked added the snowflakes as shown in an advertisement photo. I assumed they would have printed the same but they didnÃ¢â‚¬â„¢t. All the snowflakes were on top of the cup and all print on the bottom. Would have looked better mixed in my opinion. If you have a chance to review your order you can avoid these mishaps. If you donÃ¢â‚¬â„¢t have time, be very specific and look for a font that would be easy to read. Loved this item only wish the pictures had more appropriate or fitting for more occasions. Great cup. Exactly what I wanted. Is better insulated I was worried about that. No no need to worry! The details of the party were most appreciated by the mommy-to-be and these cups were a great part of the mosaic of the day. Thank you tippy toad! Couldn't be happier with these cups! They were the perfect addition to my sister's baby shower! The image was great and customizing was easy. Initially we were sent the wrong lid size (on Wednesday), but I called customer service and they overnighted (no charge) the correct lid JUST IN TIME for the shower (on Saturday). We received so many compliments from guests on these and will be placing orders for future parties! Customer service was excellent. Exactly what I wanted. And fast shipping. Thanks so much! I was apprehensive at first, when I made the decision to order this from a link I found on Pinterest, but let me tell you Brides- this is the site for you. The customer service was very polite and prompt in getting back to me. My order came in a short time even without expedited shipping, and it was EXACTLY the color, font and wording that I ordered. I am beyond pleased and would definitely use this company again! The cups were perfect for the canisters I made for my marketing Christmas gifts. Totally worth it!! Loved the finished product. Customer service was outstanding.